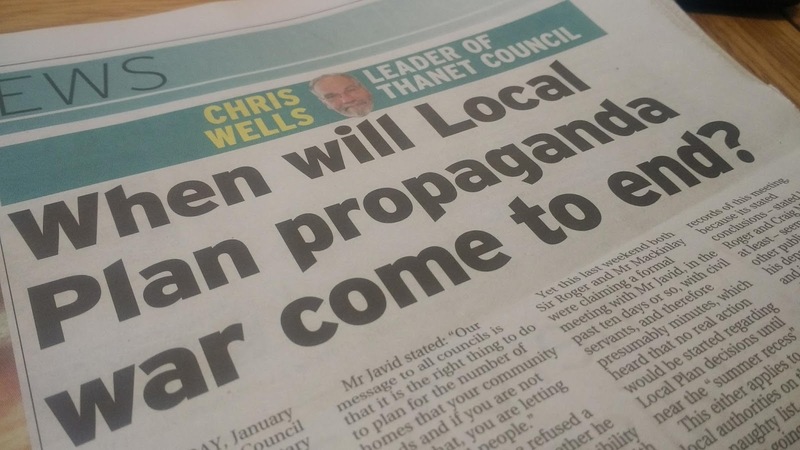 Thanet District Council posted a long-winded press release which is contained below describing the last occurrences for Chris Wells as leader of Thanet District Council. Apart from Chris Wells and a few of his cabinet colleagues I doubt there'll be many tears shed, Chris Wells and his co UKIP colleagues were elected in the main not only because of their right wing views but because they claimed that they would be strongly supporting the campaign to have Manston Airport reopened and not as he latterly supported a housing estate. To councillor Wells credit I feel that during his time in office as leader there have been fewer financial calamities than has been seen in other administration's but really he should have gone a long time ago if he stood on a platform of Supporting Manston and then quickly folded to the propaganda of outsiders he should have still stood aside for one of his colleagues who was capable of following election promises. Thanet District Council Leader, Cllr Chris Wells and Cllr Bob Bayford (Leader of the Conservative group), met on Friday 9 February 2018 to discuss the changed group arrangements within the Council Chamber. Cllr Bayford indicated as Leader of the largest group he would move to form a fresh administration. Cllr Wells agreed to step aside to minimise disruption and maintain stability at the council by ensuring a vote for a new Leader without the disruption of a vote of no confidence. Cllr Bayford said: "This is an appropriate way to recognise the changed council groupings and a sensible way forward following the fault lines that emerged across the Chamber during the Local Plan vote of 18 January 2018." Cllr Wells has today (Monday 19 February) given formal notice of resignation as of Wednesday 28 February, allowing the calling of an extraordinary council meeting to take place on Thursday 1 March to elect a new Leader for Thanet District Council. Deputy Leader, Cllr Lin Fairbrass will be Acting Leader for the period between the resignation taking effect and the results of the Leadership election. Cllr Wells said: "It has been a rare privilege to lead this council through some difficult times, facing declining budgets and increasing demand for services. My resignation recognises a simple fact of political life, that an administration needs to win votes to get policy through, and an administration supported by 13 or so of 56 Councillors would be a highly unstable proposition. 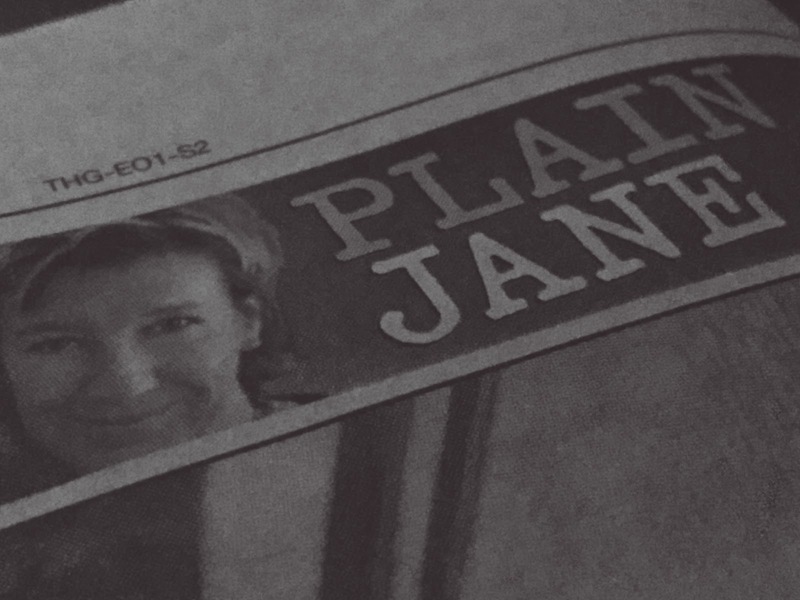 The uncertainty that would create damages the smooth running of the council, something so many have worked so hard to maintain in challenging times." Given the next stage will be a Full Council decision to elect a new Leader, neither Cllr Wells nor the council will comment further until the result of that election is known. Chris Wells in last week's Gazette says “The numbers add up, we must build more homes on the site of the airport” (Manston). 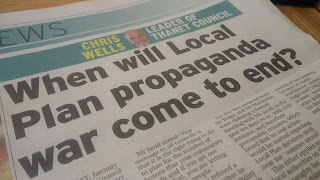 I myself don't share such unquestioning belief, in my opinion, I feel that figures can be deceptive I'm sure there are a few figures that Chris Wells would question, particularly those relating to the number of his fellow members of UKIP in Thanet who would be quite happy, were Chris Wells to do the thing they require him, to resign. 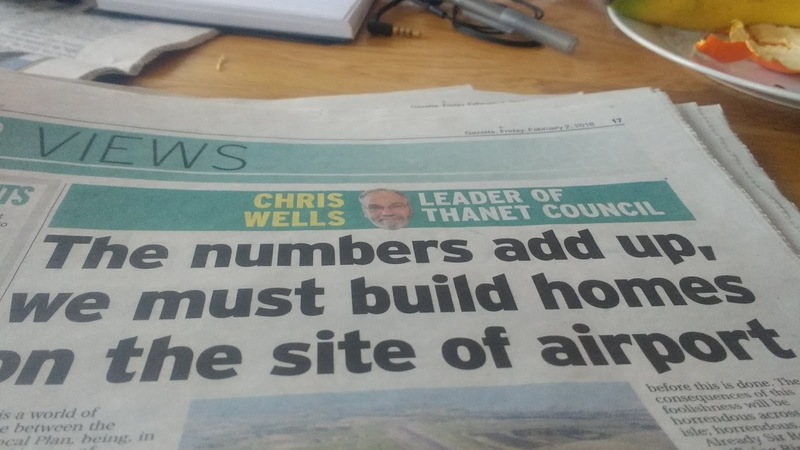 Assuming that Chris Well’s view is correct, that there is no evidence that an airport would be sustainable, why doesn't he just roll over and allow airport people to be given a chance, particularly as he was elected on basis that he would support Manston. Based on information provided by my Google home mini device, I understand that the UK average household has 2.3 people and 1.2 people working and each household has almost whole car 95% of it. So if that is correct, we can look forward to the prospect of an extra 7,000 patients for Thanet’s broken health service, 3,000 cars crowding roads to Westwood. As for jobs to support those buying or renting homes on Manston’s, new housing estate Stone HIll Park, we’ve yet to see the nearby commercial site vacated by Pfizer fully recover, I can only imagine that for Stone Hill Park housing development to prosper it will need the new Parkway Station so people can commute to jobs in London. What has always amazed me about the debate over the Manston Airport site is that nobody has suggested anything other than housing or airport use, admittedly It would be incredibly expensive to rip up Manston’s bombproof runway which I guess is why the developers of the new housing estate are featuring a “heritage” runway. I don’t think there have been any significant material changes to the local economy or geography since he was elected, so maybe having been elected on a policy he now believes wrong, the least he could do is resign as leader and a member of UKIP which would free him up to have private lunch meetings, such as the one he had in November with Ray Mallon without all that outrageous nonsense about council protocol. News outlets from the BBC to our own local newspapers, have made news less important than commentary I guess because we can all comment with out awkward facts getting in the way of our mood swings. It's not often I agree with sir Roger Gale MP however he has just sent out a statement* praising Mrs May's speech given at the launch of a campaign to become leader of Tory Party, as one of the most powerful and impressive speech he has ever heard. After a week of extreme turbulence Teresa Mays launch of a bid to become Prime Minister and leader of the Conservative Party offers I think a ray of sunshine, this I think will be a view shared by anyone who sees or has seen Theresa Mays campaign speech today. She makes Boris Johnson despite his obvious talent look like a bumbling buffoon in comparison. I think if the Conservatives have any sense they will elect Theresa May, as far as I can see it she's probably the only person with the honesty and integrity to get the United Kingdom through the coming months and years as we extricate ourselves from the EU. PS as I finish writing this I see that Boris Johnson has had the good manners to embrace defeat. I have just returned from the launch of Theresa May`s bid to become the Prime Minister of the United Kingdom and for the first time in what has been a bad week I feel a real sense of hope where before there was despair. I have been involved in politics for more than 50 years and Mrs. May`s speech was one of the most powerful, and impressive for its quiet dignity that I have ever heard. We are reminded that while she is determined to reflect the view of the British people as expressed in the referendum, and to negotiate our exit from the EU on the very best terms possible, there is also a government agenda designed to create and strengthen social justice and equality that has to be pursued and that she intends to spend the rest of this Parliament, until 2020 (and beyond) doing exactly that. Earlier in the week I said that we now needed, to take us through a very difficult period in our history, a leader with vision, courage and determination that I had found missing in the Vote Leave campaign. I believe that in Theresa May we have found someone who has emerged with the experience, skill and ability to reunite not just or even the Conservative Party but the whole Country. She accepts the reality of the vote and she is ready to bat for Britain. I hope that we can now rally behind her and make the United Kingdom work again on the world stage. Just what sort of people inhabit the United Kingdom it seems to me that if the media are right and Cameron and Osborne are also correct then everything just comes down to a few pounds per annum or whether the economy grows by one or two or three or four or 5 percent. The European remain campaign appear to believe that we are all totally without any principles, freedom, sovereignty, count for nothing. However forget money, forget migration (the other cliché), how about the petty but sinister intrusion into our lives by the European Union which now believes that suppliers of on demand media such as such as Netflix should have now have to have a quota of European content. Imagine when the Eurocrats then focus on news media, presumably newspaper such as the Torygraph will have to accommodate qouta of left right and centre political opinion, imagine the socialist morning star newspaper wouldn't be able report on its miniscule revolutionary supporters. 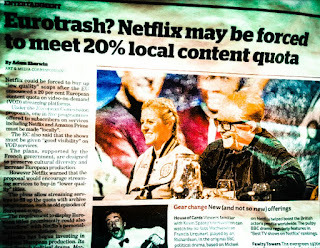 Clearly deranged and powercrazed Eurocrats feel they have to impose cultural quotas, ignoring the fact that currently individuals such as I can freely choose to pay for entertainment, I pay for Netflix because they produce and distribute quality programming which without loony euro bullies already provides content from both Europe and the rest of the world. By what logic is it necessary for the Euro state, to try and manipulate even what we watch when we relax, it's this sort of intrusion that inclines individuals to question why we need there EU. PFIZER'S CLOSURE - Will it reduce East Kent to a peasant economy? 5000* Jobs on the line?